The mortgage process involves a sea of paperwork that can be highly overwhelming. In many cases you are asked to review and sign documents without really understanding their content. It would take hours to properly read all of the legal and loan documents you are provided over the course of the mortgage process and you may be short on time as you seek to close your loan. Not fully reviewing these documents increases the chances you miss a mistake on your mortgage or end of with a different loan than you expected. In an effort to help you better understand the documents you are required to review and sign, we provide a comprehensive list of example mortgage documents below. Click on a document to review the information it contains, its purpose in the mortgage process and to learn what you should focus on when you review your actual loan documents. While our example mortgage documents are for informational purposes only they help you prepare for the numerous documents you come across when you get a mortgage. 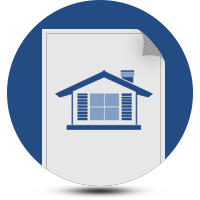 Review an example Title Report, which is the document issued by a title company or attorney that verifies the legal ownership of a property and identifies any recorded property liens or easements. Review an example Good Faith Estimate, which was the document lenders were required to provide to you when you submitted your loan application that outlined of the key mortgage terms. The Good Faith Estimate is no longer used in the mortgage process and was replaced by the Loan Estimate.